Rescuing stranded space ships, lost in the inky black void of space – now that sounds like an exciting job, doesn't it? The ZX Spectrum has a long history of confounding expectation regarding the levels of excitement found in particular jobs. Trashman and Paperboy took the commonplace and mundane and made them fun. 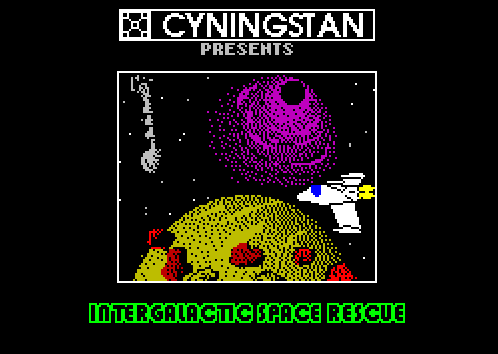 Unfortunately Intergalactic Space Rescue manages to defy expectation, and makes the fantastical rather mundane. 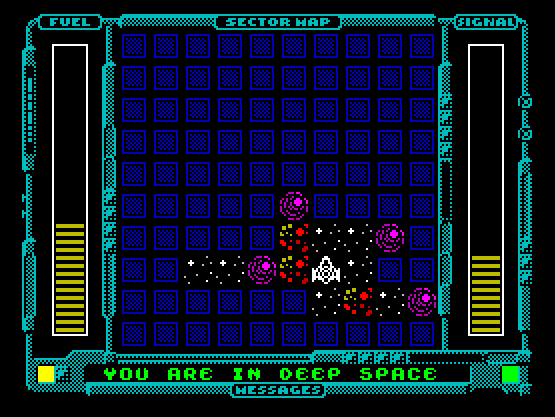 This game is by no means bad, but at its heart, it is a simple game of 'hotter/colder' where you move your ship around a small playfield trying to locate the hidden target. The 'signal strength' of the stranded ship indicates its proximity, and fuel depletes as you move. Fuel can be topped up at planets (which are sometimes revealed), asteroid belts use lots of fuel, and black holes transport you elsewhere on the map - thus helping or hindering you in your search. Running out of fuel means mission failure, although you can restart your mission, and there are 1000 levels to work through (procedurally generated, and repeatable with a seed code, so you can replay your favourite missions or continue from the place you got to when working through them all). Unfortunately, there is very little to encourage you to do this, as the game just isn't all that fun. 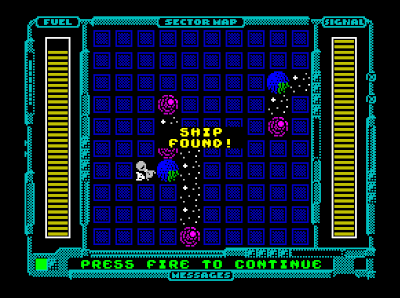 Although the graphics are clean and the sound effects are nice, the requisite of a game – even a relatively simple puzzle game – is that it should entertain on some level, but Intergalactic Space Rescue quickly becomes rather tedious, and the motivation to make it all the way to level 999 rapidly diminishes. Whilst the game itself might not be fantastic, Damian Walker should be applauded for making his source code available (which is well annotated throughout) and in this generous act providing an excellent tool for seeing behind the curtain of how ZX Spectrum assembly language programming should be done. It is just a pity that the final outcome, whilst polished, lacks the spark to keep the player interested. File under 'interesting technical showcase' rather than 'fun'. 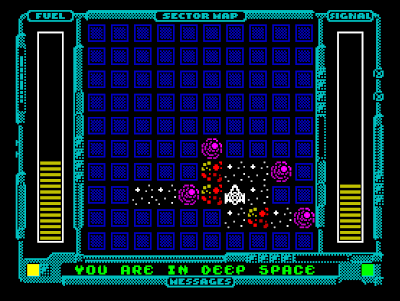 Download the game and source code here (from the World Of Spectrum site). 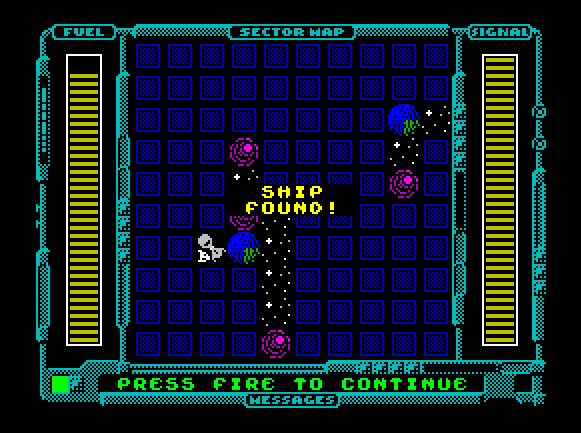 Run it using Spectaculator (shareware) or Klive (freeware).